A range-restricted (EOO 5 km²), localized habitat specialist (AOO <1 km²), occurring at two known locations and declining due to ongoing habitat loss and degradation as a result of overgrazing and road construction. The small population of fewer than 4000 mature individuals is also potentially threatened by mining. Sekhukhuneland, southern summit of the Leolo Mountains. Seeps between sheets of exposed norite bedrock above 1800 m.
One subpopulation was partially destroyed as a result of road construction (S.J. Siebert pers. obs.) and another site was noted to be under the impact of severe overgrazing (A.E. van Wyk specimen in PRU). This species is endemic to mineral rich norite substrate which is targeted for mining, and both sites are potentially threatened by habitat loss to mining. This species is currently known from two sites less than 2 km apart, where about 3000 plants have been counted (Siebert et al. 2005) at one site, and a further 1500 at the second (S.J. Siebert pers. comm.). About 20% of the larger subpopulation was destroyed as a result of road construction. Craib, C. and Siebert, S.J. 2002. 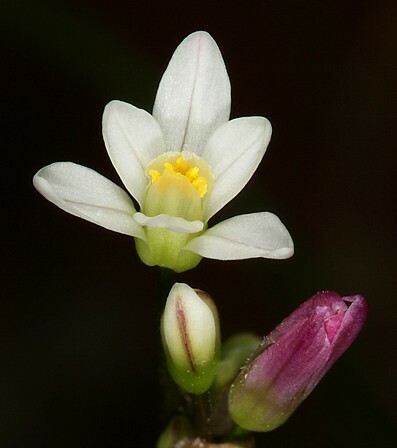 A new genus related to Tulbaghia from seepage areas on the summit of the Leolo Mountains in Sekhukhuneland, South Africa. Herbertia 57:85-90. Siebert, S., Vosa, C., Van Wyk, A.E. and Muller, H. 2008. Prototulbaghia (Alliaceae), a new monotypic genus from Sekhukhuneland, South Africa. Herbertia 62:76-84. Vosa, C.G. 2007. Prototulbaghia, a new genus of the Alliaceae family from the Leolo Mountains in Sekhukhuneland, South Africa. Caryologia 60(3):273-278. Vosa, C.G., Siebert, S.J. and Van Wyk, A.E. 2011. ALLIACEAE: Micromorphology and cytology of Prototulbaghia siebertii, with notes on its taxonomic significance. Bothalia 41(2):311-314. Vosa, C.G., Van Wyk, A.E., Siebert, S.J. and Condy, G. 2011. Prototulbaghia siebertii. Flowering Plants of Africa 62:22-28.